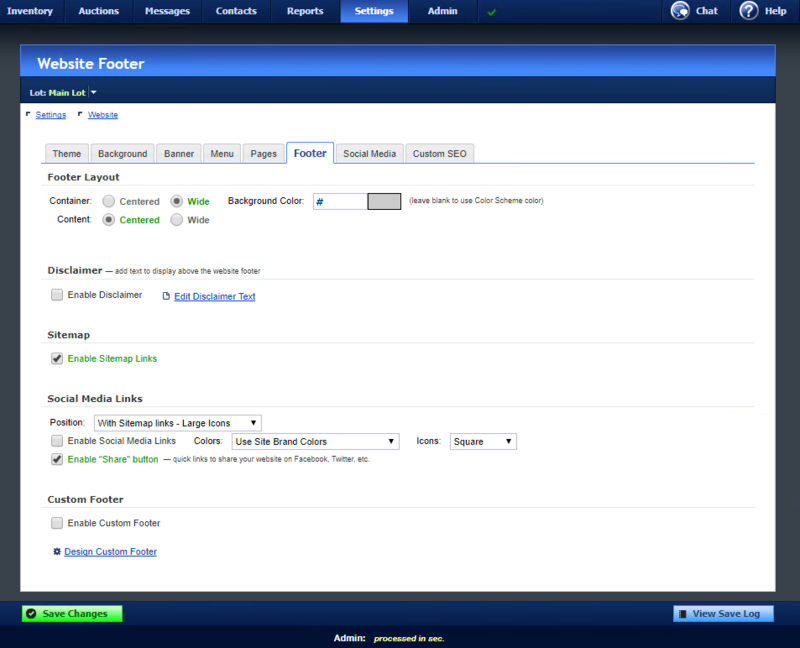 FAQ: How Do I Customize My WebManager Website? This is a basic tutorial for quickly customizing your WebManager-generated dealership website using the website Theme system. For more information about Custom Website Design work, click here. Go to Settings -> Website -> Theme. Select a Theme and Color Scheme. Many more themes will be continuously added with a variety of color schemes to choose from. Option 1: Keep my home page design. Option 2: Use the default design, but keep my Custom HTML. Option 3: Use the default design, and discard my Custom HTML. Click Save Changes and then click My Website to view your website using your selections. All menu (navigation) items (Home, Inventory, Specials, Financing, Services, Dealer Info, etc.) can be added to, rearranged, and removed if not needed. The pages under each each menu (navigation) heading can also all be customized and can be moved from one heading to another. Go to the next tab over: Banner. Centered — Banner image will be centered at the top of the page. Wide — Banner is two parts; one part aligned to the left and the other part aligned to the right. You can choose from three banner styles: Text (customizable), Image (upload your own or AutoManager can create one for you), or Flash (can also be uploaded or created). Cap Style is ONLY used with the Wide banner layout. Go to the next tab over: Menu. As mentioned above, the menu (navigation) images can be rearranged by clicking and dragging them up or down; and added or removed by checking or unchecking them. Checked items are the menus (navigation) that will be seen on the page and the unchecked ones are hidden. This, just like all settings, can be changed at any time. There are 6 custom items that can be added as new menu headings or links to external pages. Go to the next tab over: Pages. There are 30 different default pages defined, with 10 additional custom pages you can enable and modify to use in any way you like. As mentioned above, all pages can be rearranged by clicking and dragging them up or down, or even moved to other menu headings. You can can also change the Menu Label for each page here. Click on Design Page to customize any page. At the top of each Content Row, the slider manipulates the size and number of columns. Click Add Content Row to adds a new row. Rearrange Content Rows by clicking and dragging them up or down, or click Delete to remove them. Any of the elements from the Elements Toolbox can be dragged and dropped into any column in any order. Rearrange existing elements by clicking and dragging them up or down, or moving them to other columns or rows. If you are not satisfied with changes you have made, you can click on Undo Changes to revert them, or Reset Page Design to start over. Every page can be modified to contain any content and elements in any layout that you desire. Go to the next tab over: Footer. The footer is at the bottom of the page below your content and contains additional links and info that will appear on every page. You can enable a button to make it easy for users to share your website by clicking Enable “Share” button. Enter your Facebook or Twitter ID if you have them to link to your accounts on those sites. You can also add your own custom disclaimer text that will be displayed at the bottom of every page by clicking on Edit Disclaimer Text. Go to the next tab over: Custom SEO. SEO (Search Engine Optimization) is an ever increasing priority for dealership websites to be found on the web. 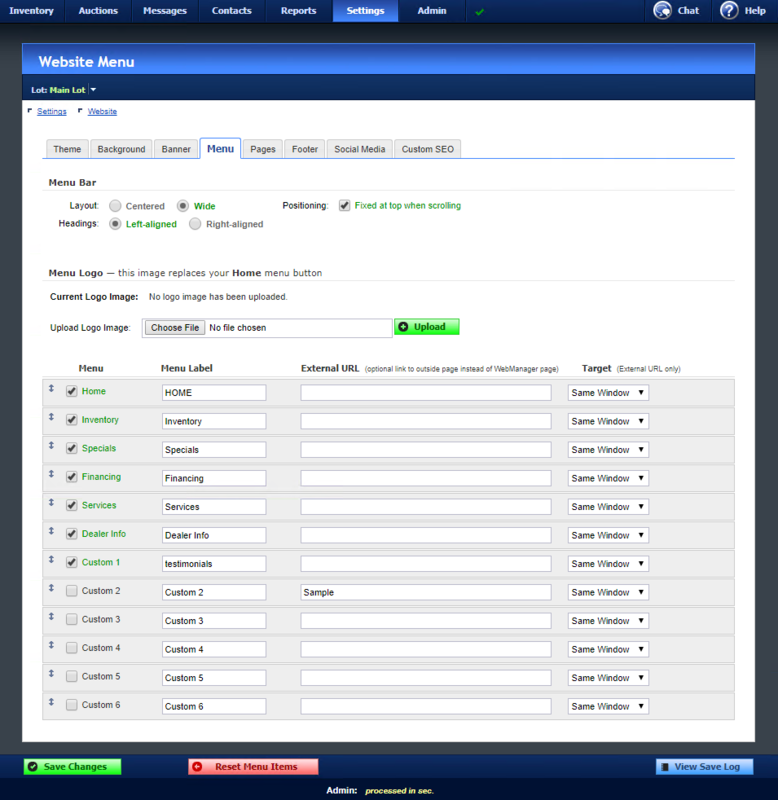 Note that all WebManager web pages are automatically built with standard SEO included. All images and navigation have unique names and “alt” tags. 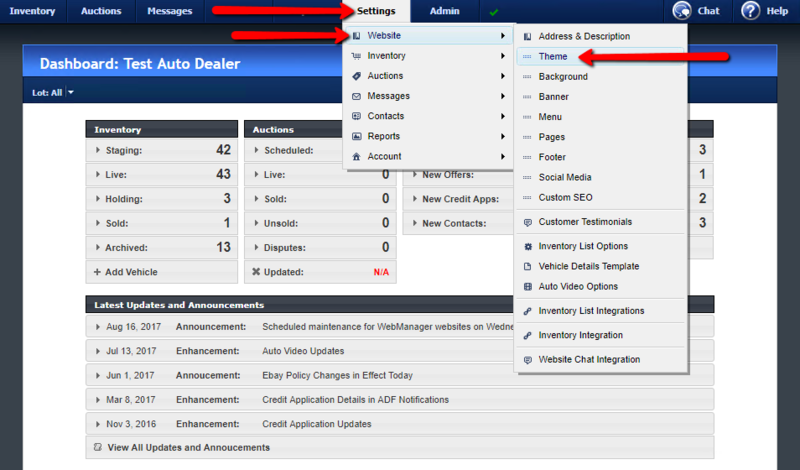 Note that all these features and more are ALREADY built in to increase web visibility for your dealership website. SEO URL — add custom URLs for ALL pages of your site. For every page, you can individually customize the Page Title, Menu Label, Alt Title, Page URL, Browser Title, Meta Description and Keywords, and SEO Text. All fields are restricted to best practice web standards that will make the site more “crawlable” by spiders and be indexed. You do not need to contact or hire a web designer to design your website. Most custom dealer website services require the dealer to contact them for even minor changes… NOT the case with WebManager. You can do all of this very easily and quickly and produce a custom, professional-looking website that reflects your dealership.